The Allen Products MM-022-BT is a universal MultiMount speaker mount that supports loudspeakers weighing up to 60 Lbs. 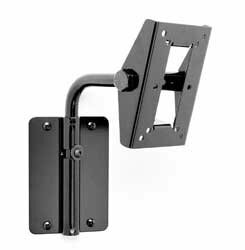 The unique mounting systems lets you quickly attach them to walls, overhangs, and other structural surfaces. Speakers can be aimed and locked in almost any direction or angle through the use of independent pan, and tilt adjustments. The MM-022-BT also adapts to both horizontally and vertically oriented standard speaker mounting hole patterns.